Tonight we are having jalapeño baked tilapia. Traditionally served with a spicy red sauce, we bumped up the flavor with red onion, lime, garlic & cilantro. 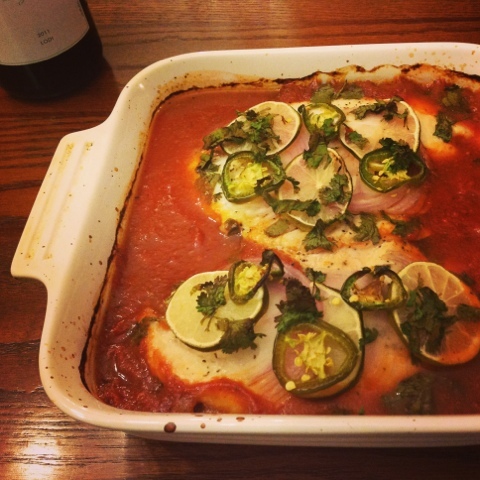 Our version tastes like a warm salsa and was the perfect complement to the tilapia fillets but would pair well with boneless skinless chicken breast too. 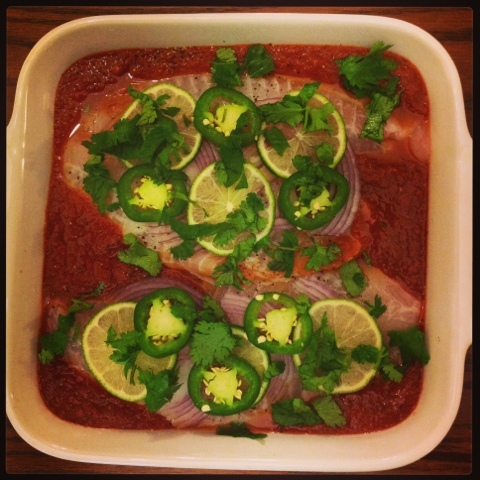 We place the fillets in a bed of our sauce and top with thinly sliced jalapeño and more red onion, lime and cilantro. Bake these for 20 minutes and done! This whole dinner takes about 10 minutes to prep and with only 7 ingredients, it couldn't be easier. We served this up on a bed of brown rice with cilantro and lime, delicious! 1. In the food processor combine crushed tomatoes, 1 jalapeño with the seeds, garlic cloves, half of the red onion, juice of 1 lime and half the cilantro. Blend until smooth. 2. Heat sauce on medium low for 30 minutes to allow flavors to combine. 4. Pour sauce into a baking dish and place fillets in sauce. 5. Finely slice remaining jalapeño, red onion, lime & cilantro and layer on top of tilapia. Could I use frozen tilapia fillets? If so, would I use the same steps as above?